I finally got around to updating my Goodreads account with a few of the book reviews I have written over the years. I have been amazed by the response of new readers to my blog. 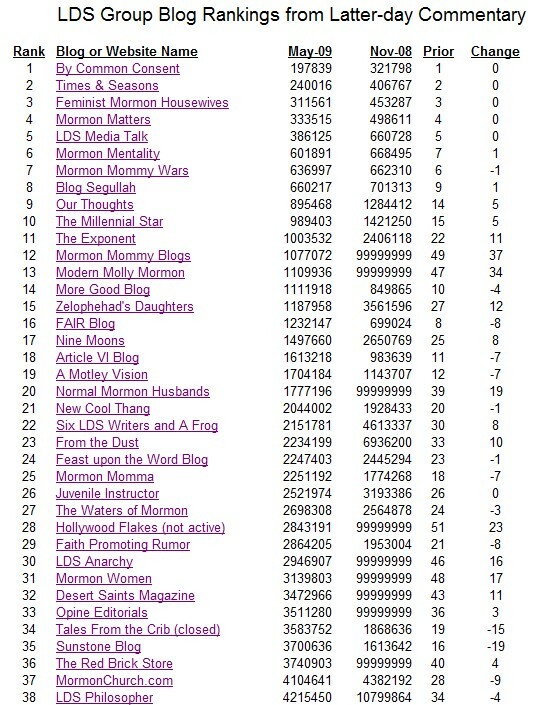 It makes me feel a little better after being dropped by ldsblogs.org. I know people have told me not to be concerned about that but it still hurts losing that extra 200-300 hits per day from their site. Why are hits important to bloggers? I suppose the answer is different for everyone. Is it selfish? Is it egotistical? Is it narcissistic? I hope not. In my case, I started blogging in 2007 before Elder Ballard asked the Saints to be more involved in the online dialogs that are taking place about the church with or without us. My inspiration was an early LDS solo blogger I followed for years. Jeff Lindsay was an early pioneer solo blogger I admired as compared to the multiple group blogs that existed for many years. Group LDS blogs are fine and get a lot of traffic but frankly, I found I did not agree with many of the viewpoints I considered “unorthodox,” in other words, worldly. I know that’s judgmental but I did not find myself uplifted by some of the discussion there. I want people to be exposed to some of the things I have found uplifting to my faith. I find that it helps my own personal study. Indeed, that is the major reason why I blog – to motivate me to read the scriptures and study the gospel. It’s hard to write about something and not sound like a fool if you haven’t read anything on the subject. I read so I can write. I write about what I read. I grew up without television so I have a difficult time sitting down in the evenings to watch TV to unwind. I would much rather grab a book. So I do. But because I want to be with Carol, I also grab my earplugs. Yes, it can be distracting but if I hold the book just right, I can block out the TV and focus on what I’m reading. I can’t get over the feeling that TV for me is wasting time. I’m sure I’ve mentioned before that I usually don’t read fiction. If you look at the list of books I’ve entered so far on Goodreads, you’ll note that the majority are non-fiction and LDS-related. I am fascinated by books about the last days, the spirit world and church history. I also like to read controversial stuff you won’t find in Deseret Book as well as your orthodox LDS book fare. I am a firm believer in the commandment from the Lord, “And as all have not faith, seek ye diligently and teach one another words of wisdom; yea, seek ye out of the best books words of wisdom; seek learning, even by study and also by faith.” I find nothing wrong with counting my reading of LDS-related books as my gospel study time. There are lots of scriptures quoted. I think I have transferred copies of most of my book reviews over to GoodReads. That made me the #56 book reviewer this month earlier today. As I wrote in a previous post, it’s going to take me months to include every book in my library, which has recently passed the 2,000 mark. I’m from the old school. I like to hold a physical book in my hand to read. Thus I buy a lot of books. But just to be sure, I decided to make a list here of my reviews with links so I can compare to what I now have on Goodreads. It truly is gratifying to receive emails from individuals who have read my reviews and felt inspired to write and thank me. It’s nice to think that maybe something I wrote has helped someone else. I have so very few original thoughts. I am guided by books. These are in no particular order. I just went backwards through my blog looking for book reviews and added them with links to the list here. By the way, reading a book doesn’t make you an expert on a subject, but it does help you talk intelligently or at least understand when others bring it up. Also, as I’m sure you know, in most cases, the person writing the book is supposed to be an expert, but that is not always true. We’re all still learning.